Written by Matt W (Greenhousestores) on 22nd Jan 2016. 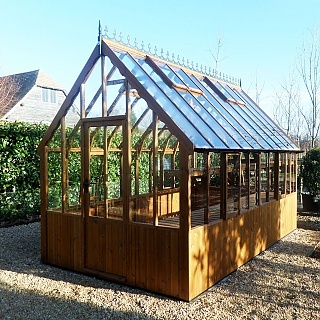 With relatively few chores to do around the garden, winter is an excellent time to give your greenhouse a thorough spring clean. Wait until Christmas is out of the way and the days are beginning to lengthen, then grab your cleaning supplies and get stuck in. If you are the type of person who isn’t very fond of cleaning, you might not see the point in cleaning a greenhouse in the garden. However, cleaning greenhouses is an essential task in any gardener’s horticultural calendar because it helps to eradicate garden pests and the build up of germs that will be detrimental to effective plant growth. If the greenhouse is mostly empty, just wait for a fine day and then get started. However, if you use your greenhouse to store some of your more delicate plants over winter, you will need to wait until the weather warms up, place them in a conservatory, or wrap them in fleece to keep them warm while they sit outside. It is possible to work around plants, but the resultant job will be less thorough. Don’t forget to switch off electricity before you start splashing water around in the greenhouse. Also take care to dry the glass of the greenhouse gently so as to eliminate streaking on the glass. Everything needs to be removed from the greenhouse. Old plants can be thrown on the compost heap and pots, tools, etc. washed. If you find any diseased plant material, burn it to prevent the disease spreading to new seedlings. Sweep the floor and clear any debris from the corners. Keep a close eye out for any signs of garden pests such as slugs and snails. Use a bucket of hot, soapy water and wash down shelves, pots and planters. An eco-friendly garden disinfectant can be used to thoroughly clean your pots and planters, but make sure you rinse them before re-using them. It’s a good idea to have a large container to hand to soak these items in, giving them a thorough wash as well as a hose pipe to hand to rinse of everything you’ve cleaned. Greenhouses have a lot of glass, and in warm, moist environments, glass becomes a breeding ground for algae and mildew. The more algae and mildew there is, the less light can pass through the glass, and in early spring this could have a detrimental effect on your seedlings. Use hot, soapy water and a bristle brush to scrub the glass clean. A pipe cleaner is useful for cleaning the cracks and crevices between panes of glass. Once this is done it’s easy to keep on top of by simply keeping a soft brush or broom to hand to remove and dirt, leaves and cobwebs that foul the glass and frame of your greenhouse. Compost in growing beds should be partially replaced to ensure your new plants have enough nutrients and are free from disease. After all your plants require a clean, nutrient rich environment in which to thrive, so taking care to renew your soil and compost makes total sense. Once you have cleaned the greenhouse and cleared out any unnecessary kit, you will be able to see if you need to replace anything else.